This beautiful curvy Old Soul plays with such ease. This was an incredibly large stalk and so this was the middle part of the stalk. I have always loved the look of the flower nubs and like to leave them on to keep this unique appearance of the flower. This one has really thick walls which is most often the case with the extremely large stalks. 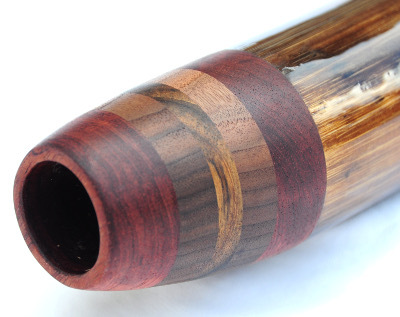 This didge takes hardly any breath and makes circular breathing so easy. If you are having trouble getting the circular breathing down this will definitely aid in learning the process. I have always loved these curvy, thick Old Souls and this one has so many great qualities. The vocals really stand out on this one and really accent the nice bass tones of the drone. Very easy bright overtones also accent this deep drone beautifully. 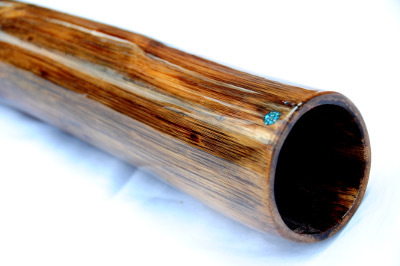 A nice solid didge that would be great for a player looking to play in a more ambient style but also want to speed up now and again.